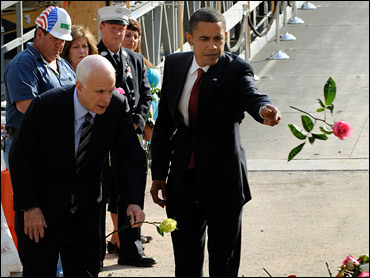 Presidential candidates John McCain and Barack Obama made ground zero their common ground for one rare day, free of politics and infused with memory. Putting their partisan contest on a respectful hold, they walked together Thursday into the great pit where the World Trade Center once stood and, as one, honored the dead from the terrorist attacks of Sept. 11, 2001. They walked down a long ramp flanked with the flags of countries, chatting at times, silent other times, and sharing a quick laugh at one point. Right behind them, Cindy McCain clutched Mayor Michael Bloomberg's arm - Michelle Obama was with her daughters in Chicago. At the bottom of the ramp, the two rivals stopped to talk with a small group of family members of the attacks' victims of seven years ago. They laid flowers at the pit's commemorative reflecting pool - a pink rose from Obama, a yellow rose from McCain - bowed their heads and walked off to speak with fire and police personnel. There were no speeches. "Thanks, we'll see ya," McCain told Obama as the Democrat patted the Republican's back and they shook hands and parted. There was no mention of politics during the meeting, reports CBS News correspondent Dean Reynolds. Following the ground zero appearance, the candidates came together in the evening at the Service Nation Presidential Candidates Forum at Columbia University. McCain and Obama discussed their views on public service with journalist moderators, sharing a handshake in between their separate sessions. McCain said he would have asked Americans to serve after the 2001 terrorist attacks by joining neighborhood watches or helping guard nuclear plants, offering an implicit criticism of President Bush's approach seven years ago. Earlier today, the Republican nominee spoke briefly at a ceremony in rural western Pennsylvania. The event was held on a large hilly field close to where United Airlines Flight 93, the third of four airliners commandeered by terrorists, crashed. McCain asked every person "to be as good an American" as the passengers and crew of Flight 93. Obama, meanwhile, asked Americans to "renew that spirit of service and that sense of common purpose" that followed the Sept. 11 attacks. With 54 days left in the heated presidential campaign, Thursday was unusual - a mutual political cease-fire in honor of the day terrorists forced four airplanes into the World Trade Center towers in New York City, a field in Shanksville, Pa., and the Pentagon in Washington, killing nearly 3,000 people. The 2001 attacks transformed the nation in many ways, and one is that every anniversary since has found those holding or seeking office struggling for ways to appropriately pay homage. Obama and McCain agreed to suspend all TV ads critical of each other for the day. Their first acts marking the anniversary were separate. McCain attended the simple ceremony in western Pennsylvania. Investigators believe some of the 40 passengers and crew rushed the cockpit to thwart terrorists' plans to use that plane as a weapon like the others that. All aboard were killed when the plane went down. CBS News' John Bentley reports that McCain said that no American should ever forget the "the heroism that occurred in the skies above this field on September 11, 2001." McCain said the only way to thank those who died on the flight is to "be as good an American as they were." "We might fall well short of their standard, but there's honor in the effort," McCain said in brief remarks. The day's truce was evident in remarks thanking McCain for traveling to Shanksville by Pennsylvania Gov. Ed Rendell, a Democrat who occasionally speaks against the Republican nominee as an Obama campaign surrogate. "It's an honor to have him here, not just as a presidential candidate but as a great American patriot," Rendell said. As the nation marked the seventh anniversary of the attacks, a CBS News poll found that most Americans believe the U.S. is adequately prepared to deal with another terrorist attack against the country. Obama issued a morning statement, recalling that on Sept. 11, 2001, "Americans across our great country came together to stand with the families of the victims, to donate blood, to give to charity, and to say a prayer for our country," he said. "Let us renew that." He included what seemed a subtle dig - though at President Bush, not McCain - with a reference to the work Bush is leaving unfinished. "Let us remember that the terrorists responsible for 9/11 are still at large, and must be brought to justice," Obama said. His campaign said no criticism was intended by the remark. Obama's only other planned outing Thursday was lunch in New York with former President Clinton. Obama's running mate, Joe Biden, went to an American Legion post in suburban Cleveland with an invitation-only gathering of area police, firefighters and other first responders. The Republican vice presidential candidate, Sarah Palin, was in her home state of Alaska, attending an Army ceremony to send her eldest son, Track, off to duty in Iraq and taking interviews with ABC News. Obama and McCain last appeared together in August when they shook hands at minister Rick Warren's megachurch in Orange County, Calif., where they spoke separately about faith and values. In June they attended the funeral of NBC newsman Tim Russert, sitting next to each other at the family's request.